One of the biggest cities in the Midwest, Indianapolis has a lot more to be known for other than its Civil War history and the Indy 500. The city and its vicinity are also home to some amazing parks, which can provide the perfect setting for long walks and weekend picnics. Here are a few of the best known and most loved parks in the area, places where you and your family can enjoy nature and recharge your batteries. Just six miles north of downtown Indianapolis you’ll find the lovely Holliday Park. One of the oldest parks in the area, it consists of over 94 acres of natural landscapes, playgrounds, and hiking trails. It was donated more than a century ago to the city, by a wealthy local couple who believed that the land’s destiny was for it to become “a place for recreation and the study of nature”. Given the large natural diversity, it’s hard to believe you’re only a short drive away from a large metropolis. Over 400 species of plants and 200 types of birds have been spotted near hiking trails and picnic sites. Foxes, beavers, deer, squirrels, rabbits, and many more local creatures have been seen either residing or passing through this park. A few miles away from the city, you’ll find the biggest park in Indianapolis, Eagle Creek Park, which is also one of the biggest of its kind in the entire United States. The 3900 acres of land and 1400 acres of water are the perfect setting for all sorts of recreational activities, from fishing to golf, hiking the 10 miles of paths, and the excellent picnic sites. The park has been managed and funded by The Eagle Creek Park Foundation after taking it over from the Municipality 40 years ago. Ever since they have done an excellent job of protecting and improving the park with numerous projects and volunteer initiatives. 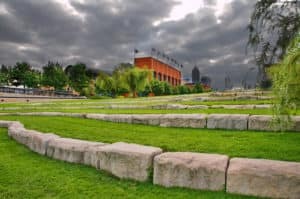 If you don’t want to leave the city to enjoy a nice picnic in natural settings, you’ll find just what you need in the Western part of downtown Indianapolis. The 250 acres of the White River State Park are beautifully divided between natural scenery and recreational or cultural attractions, so everything from a lunch hour picnic to your wedding day can happen here. It’s also home to the Indianapolis Zoo, the Indianapolis Indians baseball team, and the largest IMAX theatre in the state, so kids of all ages visiting the park are sure not to get bored. Managed by a commission that includes preeminent figures of the local community, including the Indianapolis mayor, this park is sure to continue being a great mix of nature and urban fun for many years to come. So pack some food, gather your family members, and take a short drive to either of these amazing natural parks. You’ll come home with some great stories to tell and wonderful family memories to share. wntown Indianapolis you’ll find the lovely Holliday Park. One of the oldest parks in the area, it consists of over 94 acres of natural landscapes, playgrounds, and hiking trails. It was donated more than a century ago to the city, by a wealthy local couple who believed that the land’s destiny was for it to become “a place for recreation and the study of nature”.